As the relief effort to the crisis in Haiti unfolds, so does response from mapping organisations with global reach. It is a positive development that free data is available from the Volunteered Geographic Information (VGI) community to assist humanitarian work on such a large scale, and good that there are now two sources. However, it is sad to discover that there seems to be friction between Google Map Maker and OpenStreetMap as to which organisation will prevail among governmental and NGO users. A key issue is surely to ascertain – and fast – which source of crowdsourced geographic information is most useful for which geographical area, and where the differences lie. I did this assessment today, in the hope that it is useful for the emergency relief work now, and for the reconstruction work to follow. The data is current for the 18th January 2010, and the results are available here. 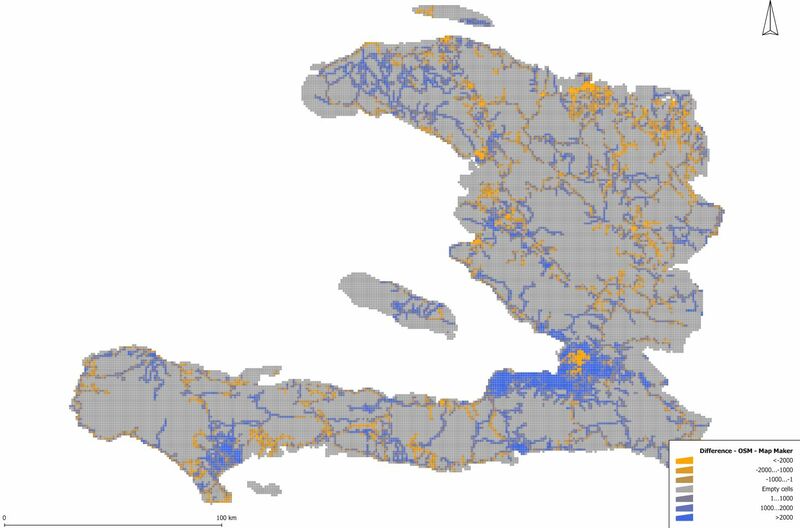 The evaluation of the coverage of Google Map Maker and OpenStreetMap for Haiti was done using the same methodology as for the comparison of OpenStreetMap and Ordnance Survey data. The shapefile’s projection is UTM zone 18N. In the map here, yellow means that there is a better coverage in Map Maker, and blue means that there is a better coverage in OpenStreetMap. The difference between the two datasets is expressed in metres. Unlike the previous comparison, where it was assumed that one dataset was the more accurate, here it is not helpful to pursue a binary approach. Rather, there are differences between the two sources of data, and these may matter as the relief work is carried out. The evaluation question is: for each grid square, which of the datasets contains more information in terms of roads length? Users of these mapping products – it can help in judging which dataset to use for each area. Users – it can facilitate conflation – the process of merging datasets to create a better quality output. Mappers – it can illuminate which areas to focus on, to improve coverage. If you download the file, notice that the field OSMMMClose indicates that the two datasets are very close to one another – the value 1 is associated with grid squares where the difference between them is less than 200 metres. This might be useful as an indication that the two datasets agree with each other. I hope that this assessment is helpful for those using the data for the relief effort. If you have ideas on how I can help further in this way, please get in touch.